Army Design Module Is Out of Beta Test! 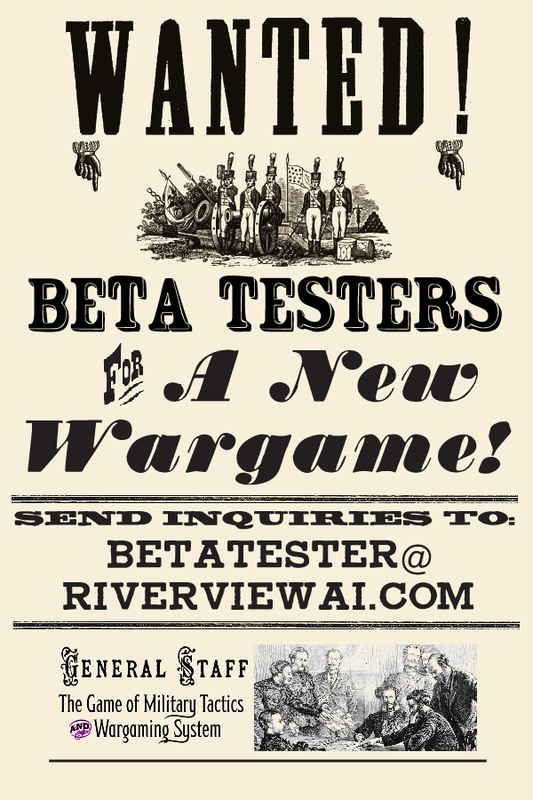 We are extremely pleased to report that the General Staff Army Design Module has now completed Beta Test and we are moving on to sending out the Map Design Module to our valiant Beta Testers! 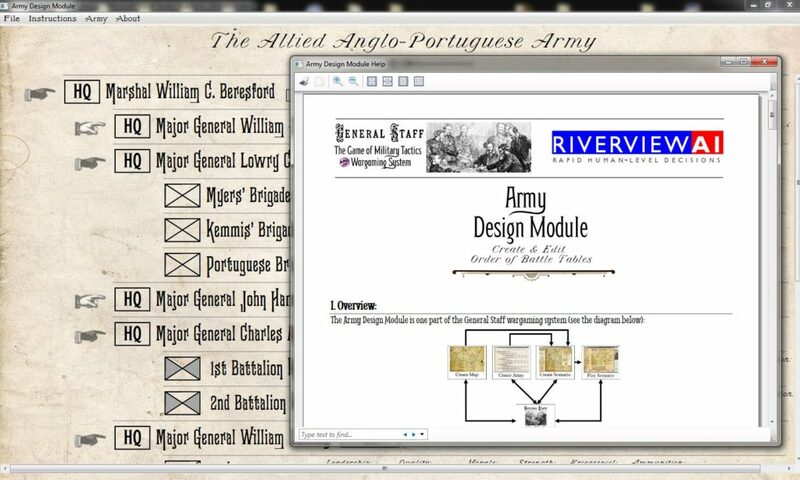 Screen capture of the Army Design Module showing the built-in Help documentation. Click to enlarge. The Army Design Module allows users to easily create new army Order of Battle Tables that, when combined with a map and another army, become battle scenarios that can be played in the General Staff Wargaming System. This entry was posted in Army Design Module, Beta Testing and tagged Army Design Module, Beta Testing on June 9, 2017 by EzraSidran. This entry was posted in Army Design Module, Beta Testing and tagged Beta Testing on May 11, 2017 by EzraSidran. The Army Design Module is Ready for Beta Testing! The Army Design Module is Ready for Beta Testing and we’re adding the in-app help files now! This is pretty exciting and we hope to be rolling out the next modules (Map Design and Scenario Editor) very quickly as they are almost completed, too. After over a year of hard work General Staff is becoming a reality! 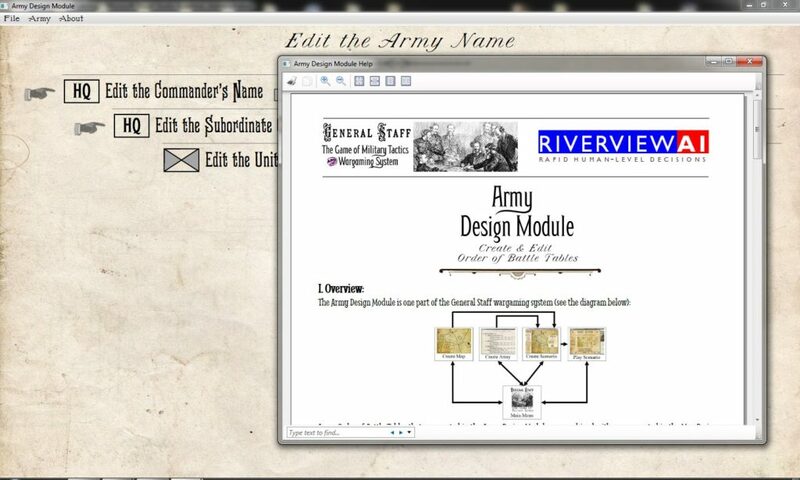 A screen capture of the Army Design Module with the in-application Help files. Click to enlarge. This entry was posted in Army Design Module and tagged Army Design Module, Beta Testing on May 9, 2017 by EzraSidran. Order of Battle Table Screen Captures. Even though it was fun to create, the YouTube video of the Order of Battle Table / Create Army Module for General Staff doesn’t have high enough resolution tho show the clear, sharp screen images that do it justice. 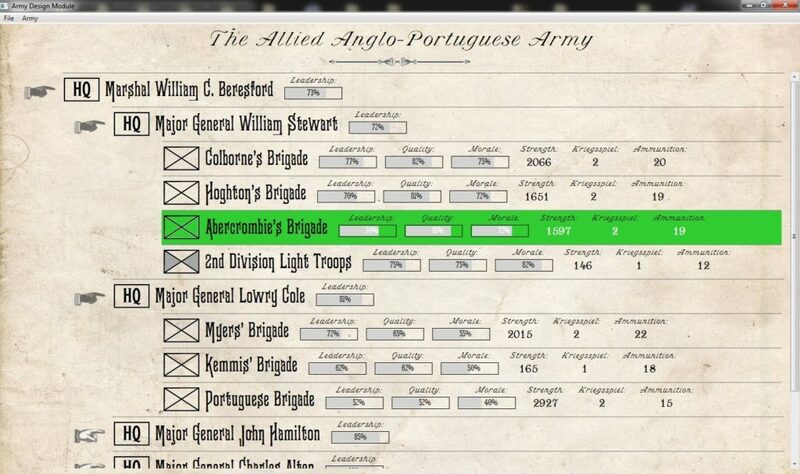 Below are a couple of screen captures from the section of General Staff that allows users to create their own armies. We will next work on the Create Maps Module that allow users to design their own battlefields. 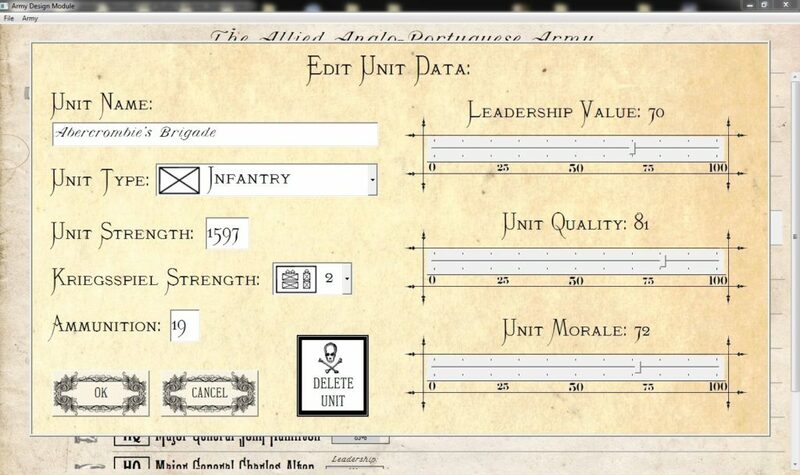 Screen capture from the Create Army Module of General Staff. This shows a section of the Order of Battle Table for the British-Portuguese army at the battle of Albuera (16 May 1811). Click to enlarge. A screen capture from the Create Army Module. This shows the ease of editing unit information. These are the variables, and unit types, that were selected by over 150 wargamers in our previous survey. Click to enlarge. This entry was posted in Army Design Module and tagged Order of Battle Table on February 12, 2017 by EzraSidran. Video Describing the Order of Battle Table Creation Module! We’ve dug back into the original Pathe news archives to find this old movie reel describing the new Order of Battle Table Creation / Create Army Module for General Staff. We hope you enjoy this treasure from the past! This entry was posted in Army Design Module, Video and tagged Army Design Module, Create Army Module, Order of Battle Table, Video on February 12, 2017 by EzraSidran.